It's Not Just About the Ribbons book cover. 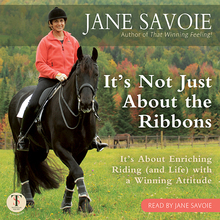 Trafalgar Square Books is proud to announce the release of our first audio book for horse lovers from one of our original best selling authors, Jane Savoie. We know horse people lead busy lives, often juggling work, family, and riding, so we want to make it easy to listen to some of our top authors’ best advice while commuting, or during your morning walk, or while sweeping the barn aisle or raking the arena track. There’s no better place to start than with Jane Savoie’s contagious enthusiasm, which couldn’t be better highlighted than in an audiobook read by Jane herself. 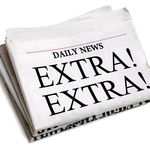 It's Not Just About the Ribbons was the followup to Jane’s breakout bestseller That Winning Feeling! the first book ever to recognize the importance of training the mind and shaping attitude in order to achieve higher levels of riding skill. 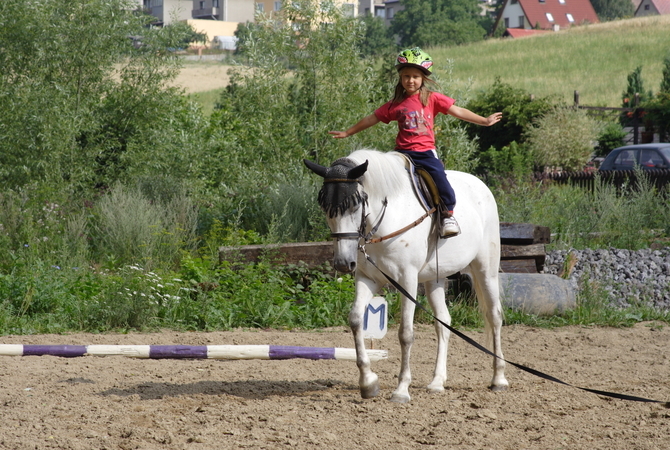 In Ribbons, Jane shares the tools and ideas for self-improvement that she has used, not only to help herself deal with challenges, but her students—who range from Olympic contenders to intermediate riders—as well. Full of shining examples of the success of her methods of dealing with riding’s—and life’s—challenges, this book is essential for anyone who is passionate about horses but may be struggling, at some level or other, with negative emotions and frustration from slow development of riding skills. For more information about the It's Not Just About the Ribbons audiobook, click here, or contact rdidier@trafalgarbooks.com.